This business lease has been drawn to let a retail unit in a parade of shops owned by the same landlord. Tenants are likely to share some facilities and services. This agreement allows for service charge recovery and use of shared facilities between tenants. The shop could be for any purpose. Examples are: retail of goods, restaurant or cafe, or service provision such as PC repair or estate agency. If a restaurant, cafe or fast food outlet will be operated from the property, Restaurant lease agreement may be more appropriate. 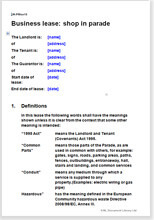 This lease contains specific clauses for commercial kitchens and food retail. If you don't require service charge recovery provisions, Lock up shop lease agreement.